In my house, I am the only coffee drinker. This means that I can choose the type (caffeinated or decaf), flavor and strength of my coffee. I fell in love with coffee when I was in high school and have never looked back. To me, it is relaxing to sip on a cup in the morning and to enjoy a cup while visiting with friends. Holding onto a mug also gives me something to do with my hands instead of flapping them around. Ha ha! Well, we have just ended a wonderful holiday season and I am sure many of you enjoyed coffee in fun and delicious seasonal flavors. I also love how there are special liquid coffee creamers that take on a holiday feel as well...eggnog, hazelnut and peppermint to name a few. YUM! Well, just because the holidays are over, doesn't mean you cannot enjoy a taste of them now! I am sure many of you have heard of Community Coffee and their delicious variety of coffees. Well, I have known about them for some time now but have never tried their brand before. I was always curious and up until recently, I didn't realize what I was missing. Community Coffee offers more than just plain coffee. They also carry whole bean coffee, teas, and flavored coffees. I am a HUGE fan of flavored coffee and this was what first attracted me to this company. For four generations, the Saurage family of Louisiana has owned and operated Community Coffee Company. In 1919, Henry Norman "Cap" Saurage discovered the secret of making this great-tasting coffee in his country store on the north edge of Baton Rouge, Louisiana. He named his coffee "Community" in honor of his community of friends. In 1924, he closed the store and converted his backyard barn into a coffee mill, using coffee beans purchased from a local roaster. In 1941, Cap's son H. Norman Saurage Jr. purchased the company's first coffee roaster, having decided that Community should roast its own coffee to ensure quality at every step. A roasting plant was built in Baton Rouge in 1946. Over the years, Community Coffee Company would take countless steps to ensure the quality of its product. In 1955, the company began importing green coffee beans directly from coffee plantations in Brazil. In 1970, a new plant was built on the Mississippi River in Port Allen, Louisiana. In 1980, Community introduced the nation's first vacuum-sealed coffee package. The first CC's Community Coffee House opened on the corner of Jefferson and Magazine Street in New Orleans in 1995. Dozens more opened during the 10 years that followed. It's been more than 90 years since Cap Saurage founded Community Coffee Company, but our mission has never changed – to share our passion for great coffee with our customers. I just love reading stories like these about families who have started a business, have become successful and are still growing in popularity. To me it shows integrity, grit and perseverance...no doubt the coffee market is vast and the competition is fierce. Kudos to ANY family owned and operated company that can withstand growing competition and difficulty!! So, for this review I was sent the Season's Greetings Variety Pack from Community Coffee and let me tell you, this is a spectacular gift pack! As you can see, it comes nicely packaged in a wooden crate complete with a gold ribbon and gift tag. The coffee bags are labeled beautifully and look so festive. I love the flavors as well...Cinnamon Roll, Breakfast Blend, Supreme Holiday Jazz and Bread Pudding. Who would have ever thought coffee could come in such luscious flavors!! I am also a huge fan of ground coffee. Granted, it probably isn't as fresh as grinding the beans yourself but because I do not have a coffee grinder, the ground variety works best for me. I have decided that my favorite flavor in this gift pack is the Cinnamon Roll. It definitely smells like cinnamon rolls and in order to really taste it, I didn't add anything to the coffee but drank it black. The cinnamon flavor was subtle and not overwhelming and it just tasted comforting. Truly a great flavor to serve for a holiday brunch! 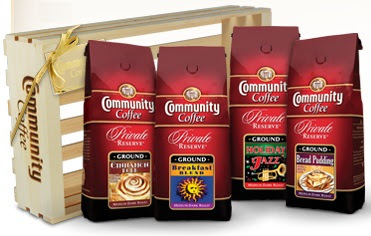 This Season's Greetings Variety Pack retails for $34.99 and is available for purchase directly from Community Coffee's website, along with many other really fantastic gift packs! So, in my opinion...the Season's Greetings Variety Pack from Community Coffee is a wonderful and truly tasty selection of coffees! I love how they are specifically flavored for the holidays and LOOK so festive. Although it contains seasonal flavors, this gift pack would be lovely for any time of the year as yummy coffee never goes out of season! Visit Community Coffee and tell me what you would like to try from their products. :) You do not have to be a blogger to enter, but you must have a valid email where you can be reached should you win. If you do not leave an email address, it must be where I can easily find it. This giveaway is open to US (mainland US only) and Canadian residents and will end 1/24 at 11:59 pm EST. The winner will be chosen using random.org and will be notified by email. The winner will have 48 hours to respond, or another winner will be selected. 1. "Like" Community Coffee on Facebook. 2 entries, so 2 comments. 3. Become a GFC follower of My Opinion. Leave a comment to let me know that you did/do. 3 entries, so 3 comments. 5. Tweet about this giveaway. Leave a comment with the link. 3 tweets per day, at least 1 hour between tweets. 3 comments per day. Disclaimer: I received no monetary compensation for this post. I did receive a Community Coffee Gift Pack for review purposes. All quotes and stock photos are from the Community Coffee website and email. Prize is being mailed by the sponsor. All thoughts and opinions are 100% mine. Oh, the Bread pudding sounds great! French Quarter Fusion™; it sounds delicious! "Like" Community Coffee on Facebook. Follow Community Coffee on Twitter. I would like to try the ground bread pudding coffee. Like Community Coffee on FB as Kristi Hayes #1. Like Community Coffee on FB as Kristi Hayes #2. Following community Coffee on twitter as xraygirl2008 #1. Following Community Coffee on twitter as xraygirl2008 #2. Voted for In My Opinion today on Picket Fence. I would like to try the ground mocha java. I would like the 12 oz. ground hazelnut coffee. I like community coffee on fb. I "like" Community Coffee on Facebook (Sheila Korman)—entry #1! I "like" Community Coffee on Facebook (Sheila Korman)—entry #2! I Follow Community Coffee on Twitter (@skkorman)—entry #1! I Follow Community Coffee on Twitter (@skkorman)—entry #2! I'm a GFC follower (skkorman)—#1! I Follow Community Coffee on Twitter (@skkorman)—entry #3! I'd like the french vanilla coffee/ My favorite. I would love to try the Pecan Praline blend. I want to try their Ground Breakfast Blend and their coffee pods. I would love to try the Ground Mocha Java. I like Community Coffee on Facebook. I like Community Coffee on Facebook #2. I follow Community Coffee on Twitter. I follow Community Coffee on Twitter #2. Carnivale Cake blend sounds intriguing. I'd love to try the Carnivale Cake blend. The new orleans blend with chicory! This flavor sounds so good to me - would love to try it Carnivale Cake. I would like to try the Ground Louisiana Blend. Thanks! I Like" Community Coffee on Facebook.